Yesterday, I shared how Jesus explains in the Parable of the Unmerciful Servant (Matthew 18:25-30) that we have been forgiven a tremendous debt. It is a debt we could never pay. But God has canceled that debt on our behalf because of Jesus’ sacrifice on the cross. But there is more to the story. Today we talk about how our forgiveness is necessary. The servant who was forgiven the $14 billion debt encounters his fellow servant. This fellow servant also happens to owe the first servant a debt. In this case, the debt is 100 denarii. A denarius was one day’s wage for an unskilled laborer. Let’s say $15/hour is the going rate for such a laborer. This is the minimum wage that has been recently set in many places in our country. We assume an 8 hour work day. So $15×8(hours)=$120/day. Then 100(days)x$120=$12,000. This would have been the approximate amount of the debt owed by the second servant in the story. $12,000 is a significant amount of money. Not a fortune. But it is nothing to scoff at. Losing $12,000 is not the same as losing $100. But $12,000 is nowhere in the neighborhood of $14 billion, the debt of the first servant. The first servant has no mercy on his fellow servant. The text says that he began to choke the servant, demanding him to pay the money. He was enraged. You can almost hear him screaming and yelling. It is an ugly scene. At the end of this confrontation, the first servant has the second servant thrown into debtor prison until he could pay the debt. You can’t help but be distressed by the actions of the first servant. He was forgiven so much but has no compassion to forgive such a small thing in comparison. And those who saw what happened had the same reaction. They go and tell the king what has happened. At that point in time, the king seized the servant who had been forgiven $14 billion. He calls him a wicked servant and also has him thrown into prison until he would repay the $14 billion, a debt we know he will never be able to pay. Essentially, this was a life sentence. The servant will never get out of that prison. Jesus then comes out to say, “So it will be with done to you if you do not forgive your brother from your heart” (see Matthew 18:37). It sounds harsh. But consider what Jesus teaches us to pray in the Lord’s Prayer. “Forgive us our trespasses (sins, debts), as we forgive those who trespass (sin or are debt) against us” (see Matthew 6:12,14-15, Luke 11:4). Sometimes we pray the Lord’s Prayer without even considering the words we are saying. The question I want to ask you today is if you really want to pray that prayer? Do you really want to ask God to withhold forgiveness from you if you do not forgive others who have wronged you? 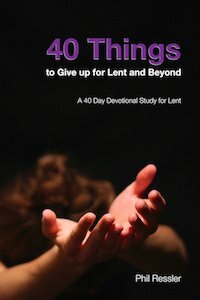 Do you want to be locked into an eternal prison for failing to forgive your brother or sister? There is a saying, “when I forgive, I release a prisoner, only to realize that prisoner was me.” When we fail to forgive, it keeps us locked in a prison. It keeps us locked into bitterness, anger, resentment, envy, and pride. It is a prison of our own doing. But the doors of the prison have been opened up through God’s forgiveness. We no longer need to sit in that prison. Our release has been secured. But will we still choose to live as a prisoner when we have been freed? Forgiveness is hard, (we will talk more about that tomorrow), but forgiveness is necessary.